2). Cleaning the pin and hole very well. 3). Expanding the pin in the hole as best as possible to eliminate any microscopic gap. I've tried with a ball pein hammer and had less than ideal success. 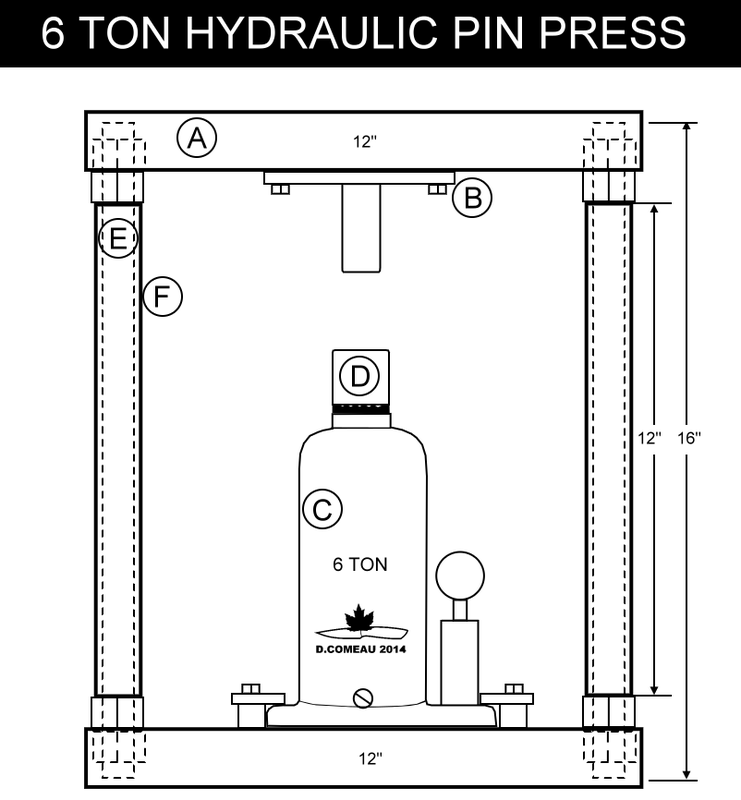 A fellow knifemaker in my forum recommended a process of using a hydraulic press and his results were impressive. But... I had no press. Enter an inexpensive 6 ton bottle jack and some steel and now I am going to Mcgyver something again. One design feature I want is to be able to remove the bottle jack and replace it without easily. D - 1" Round bar. G - Jack cap (or ram cap), see detail. I happened to have some heavy duty 3" C channel sitting in my garage and I figured I'd get some threaded rod and make a frame. The question I had was "What is the strength of the rod?" I did some research and found that most threaded rod is Grade 2 (low carbon steel), which is not really strong. But if the rod is sized right it will suit my needs. 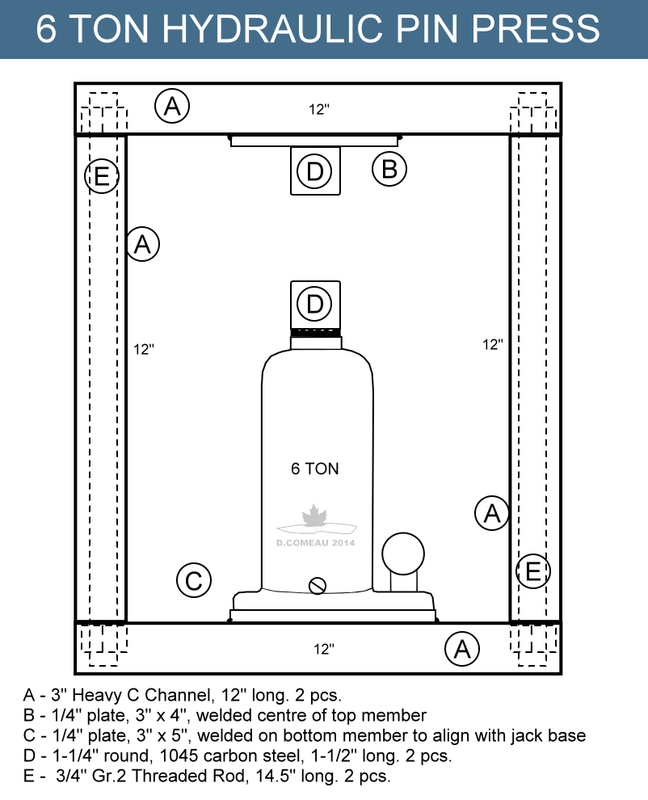 So 0.44 square inches multiplied by the ksi rating of 55 is around 24 or 24,000 pounds per rod. 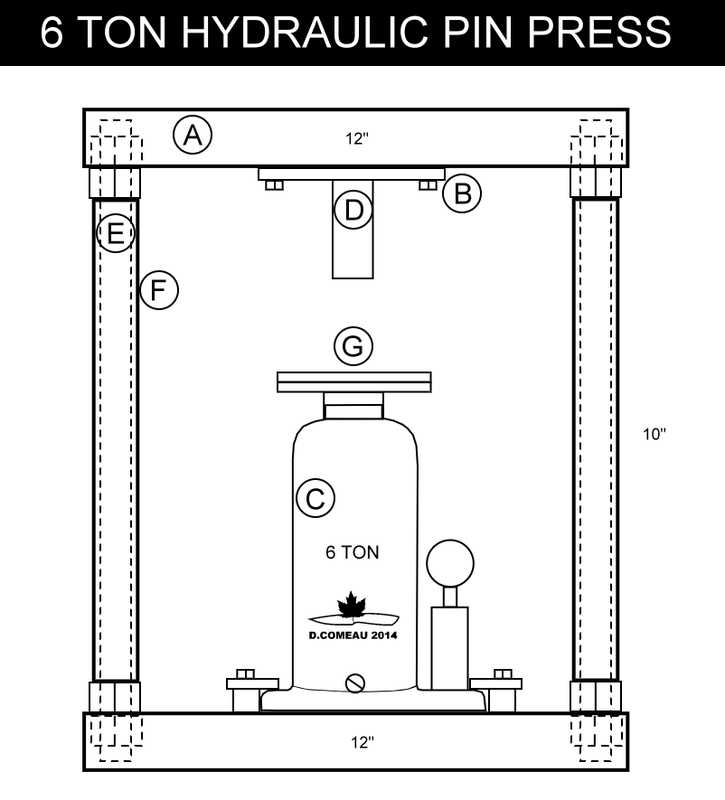 As there are two of these rods we can double the rating to 48,000 pounds or just under 25 tons. I could use something smaller, but I like over building stuff and 3/4" is cheap enough. I made a spreadsheet in Excel to show some of the proof loads for various NC (National Coarse thread) Grade 2 rod. See below. Of course if you can get your hands on some Grade 5 rod, then the ksi should be around the 85 which is more than 50% stronger than Grade 2. In any case, we know what to expect from certain diameter rod and the associated nuts. I cut the C channel on the band saw into two 12" pieces. Using a 3/4" SAE washer I marked the holes. These ended up being 3/4" in from the end and in the centre (1-1/2"). A 3/4" bi-metal hole saw and some cutting fluid works great for making the large holes. Go slowly and keep the heat down. Now we need to mark the centre of the bottom for placing the jack. Cut the 3/4" threaded rod to 16" lengths and clean up the ends to the nuts thread on easily. Note: I could not find Grade 5 nuts in 3/4" so I had to use Grade 8. These are cadmium plated. Just a reminder, NEVER EVER WELD CADMIUM. I used a couple of pieces of 3/8" x 1/2" bar stock for the jack hold downs. Depending on your jack you may only need a few bolts or you my have to rig something similar that clamps the jack into place. Two 12" pieces of 3/4" electrical conduit (EMT) make a nice cover for the threaded rod. This doesn't add any strength, but will protect your hands from the sharp threads. This is the view of the top member. The flat washers will help distribute the load. A photo of the basic assembly. Now to add the parts for contact area. 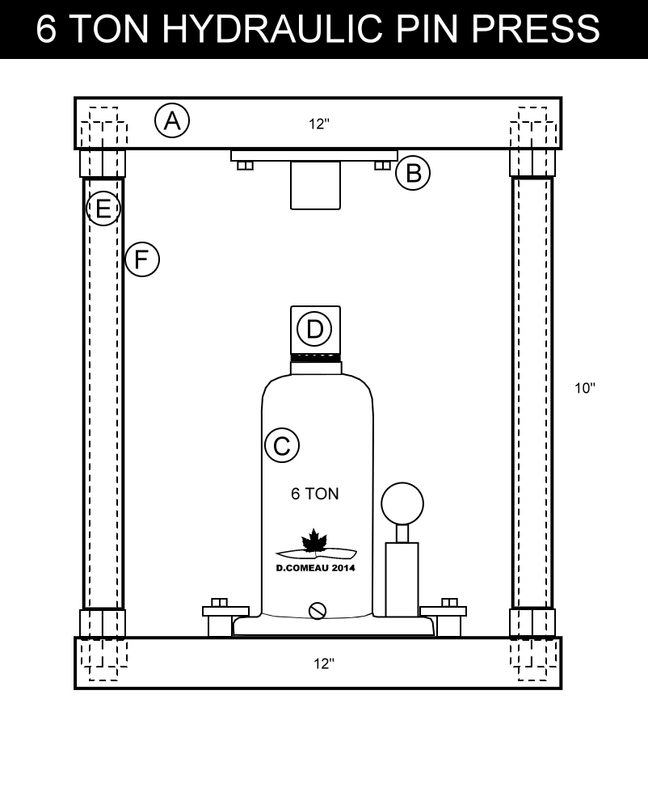 If the jack base is set properly, the cylinder should be at the 6" mark (on center). Here I am using the jack to temporarily hold the contact bar in place. Once under pressure, I marked the plate for where to mount the round bar and tack welded it in place. 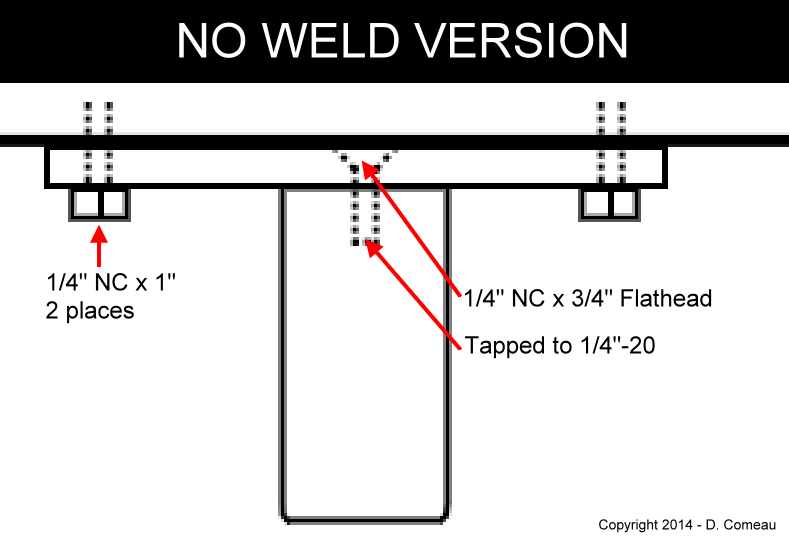 You may opt for a no-weld version and drill and bolt the plate to the top member and use a flat head 1/4" bolt threaded into tapped hole in the round bar. This would be easy to remove and replace if necessary. The jack cap is a piece of pipe with some plates attached to it. It slips over the jack and becomes the second contact point. I had some scrap 1/4" x 2" plate so I made a reasonable cap by stacking a few of these and tack welding them. You could use the jack itself, but the surface is grooved to reduce slipping. What we want is a smoother surface for pressing. I could have ground the the cap smooth, but that sort of defeats the remove and replace concept behind build. My particular jack requires something with an inside diameter of 1.25" or so. Some schedule 40 pipe does the trick as it's only meant to slip over the ram. You will probably want to add some angles for mounting to your bench. A couple of clamps would work just a well. I had two corner lift plates from an industrial enclosure and they already had 3/4" nuts welded in place. I simply screwed them on the bottoms of the threaded rods. 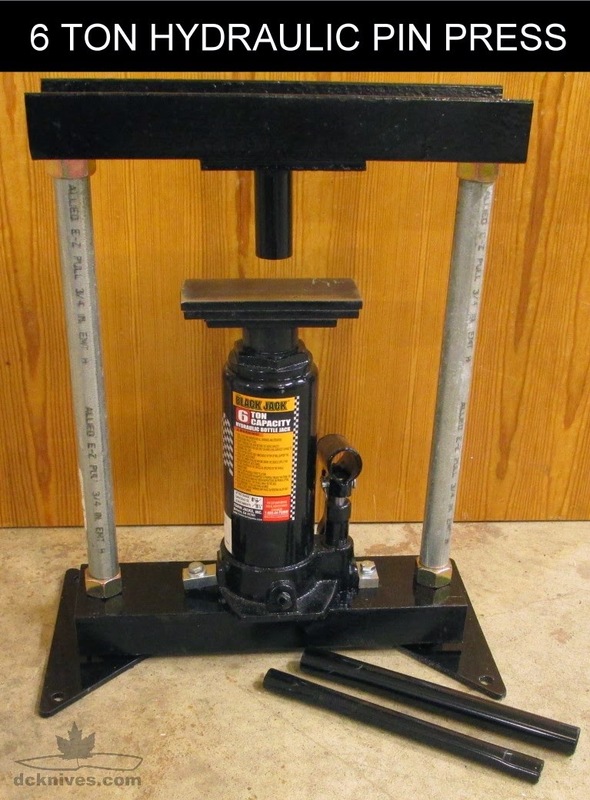 I will add some magnets to the press to hold the jack handles when they are not being used. Perhaps two springs could force the jack back down when the release valve is opened. Not a big deal for me, but if you used this 100 times a day, you'd be wishing it came back down by itself.